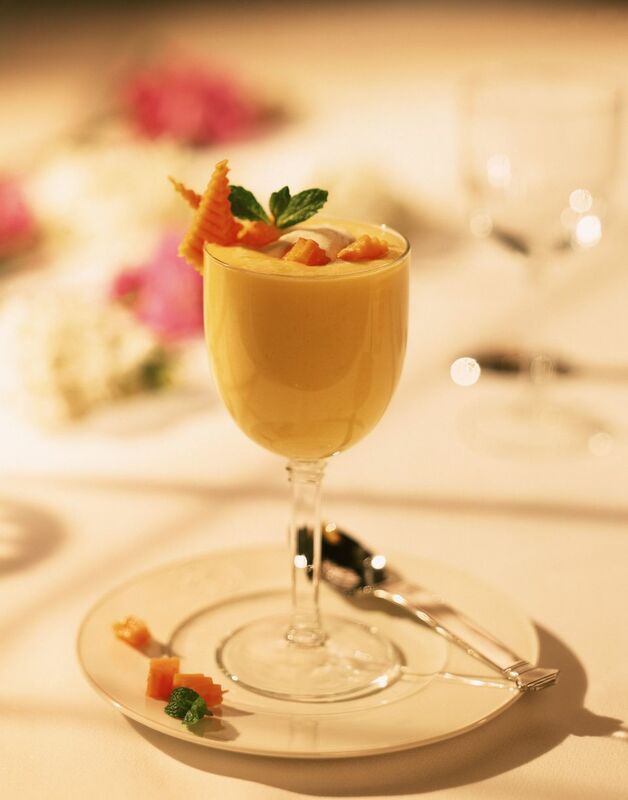 This mango custard is a delicious Thai treat and a terrific way to enjoy fresh mangoes while they're in season. It also happens to be good for you (no heavy cream required!). You'll need two fresh ripe mangoes—or, if mangoes are not in season, canned mango may also be used (find it in the Asian section of your local supermarket). Makes a great dessert any night of the week, and you can whip it up and have it in the oven in just 15 minutes. I like it served warm but if the weather is hot it's also delicious straight from the refrigerator. Excellent as a dessert, with tea as an afternoon snack or with coffee at breakfast (the eggs provide lots of protein!). Preheat oven to 350 degrees. Grease 4 ramekins (or more depending on the size of your ramekins) and set aside. Slice one mango open on either side of the stone. Scoop out flesh and place in your blender. Add 2 Tbsp. water and blitz to create 1/3 cup mango puree (any extra can be eaten). Set aside. Now take the other mango and slice it open the same way. Using a tablespoon, scoop out 4 tablespoon-size slices (1 for each ramekin) and set into a small bowl. Sprinkle with brown sugar and gently turn slices to coat. Set aside. Crack eggs into a mixing bowl and whisk by hand or with blender for 1 minute. Add white sugar and vanilla and whisk again until smooth. Add the mango puree plus coconut milk and stir until smooth. Distribute this mixture among the ramekins, filling to 2/3 - 3/4 of the ramekins. Gently place 1 brown-sugared mango slice on top of the custard of each ramekin. Bake for 30 to 45 minutes (depending on the size of your ramekins), or until custard has risen and is 'set' (custard should rise and be firm to touch—an inserted fork should will out clean). Note that custard will 'drop' a little once it has been removed from the oven—this is normal. Serve warm in the ramekin, or top with a scoop of vanilla or coconut ice cream. ENJOY! When it comes to choosing the sweetest, most flavorful mangoes, the nose knows! Bring the mango up to your nose and smell. If you can detect little or no fragrance, the mango isn't good. Also, you should be able to 'indent' it easily when pressed with your thumb. The mango should be yellow or mostly yellow in color, not green at all.